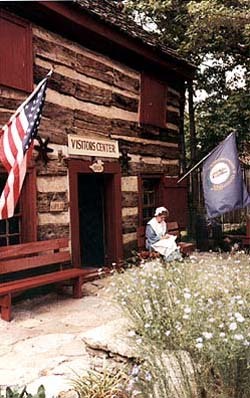 Pre 1790 Visitor's Center - The Cane Brake listed in the 1790 Federal Census is one of the original 119 log cabins in Washington in 1790. Costumed guides conduct many different tours throughout the village as well as the Covered Bridge and Underground Railroad Tours. They also conduct the "Log Cabin Learning" tour to hundreds of school children each spring. Many schools use this very educational two-hour session, which takes place in three of Washington's original log cabins as a field trip. For reservations call 606-759-7411. The Visitor's Center has many historical books for sale. They also carry a selection of souvenirs. There is a very informative video one may sit and view in the comfort of this log museum. Hours are: Monday through Saturday 10:00 a.m. until 4:30 p.m., and Sunday from 12:00 to 4:30 p.m.